“THINGS are only going to get worse” - that’s the view of Solihull’s high-speed rail opponents, following the Government’s decision to press ahead with the controversial project. What a week for critics of the HS2 scheme! A petition of no less than 108,000 signatures went in to 10 Downing Street, plenty of them from Solihull and Meriden, all calling for the £34 billion project to be scrapped now. I HAVE been listening with increasing frustration to the presentation of HS2 simply as a way of Midlanders getting to London a bit quicker. Last Saturday, when HHAG staged its HS2 exhibition in Chelmesley Wood, residents confirmed our worst fears about its likely impact. 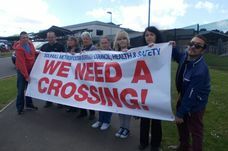 HIGH speed rail would mean the end of the Meriden Gap, Solihull Council was told this week. Not a good start to 2011 when we walk down our road and see that it has been used as a ‘dog’s toilet’, and I am sure this is not the only road. THE GOVERNMENT’S preferred route for HS2 will ‘rob Peter to pay Paul’ according to a local opposition group. IT’S nine months since publication of the HS2 proposal. Some of the information has got distorted along the way, and needs clarifying. With overcrowding on the railways back in the news, I went to see how close our bit of the West Coast Main Line is to being “full”. IT’S encouraging to see the High Speed 2 railway proposal has become a regular topic in your letters page.